While antibiotics and antacids may be needed to treat a stomach ulcer, there are certain foods that can exacerbate the symptoms including pain, a burning sensation, indigestion, gas, nausea and vomiting. 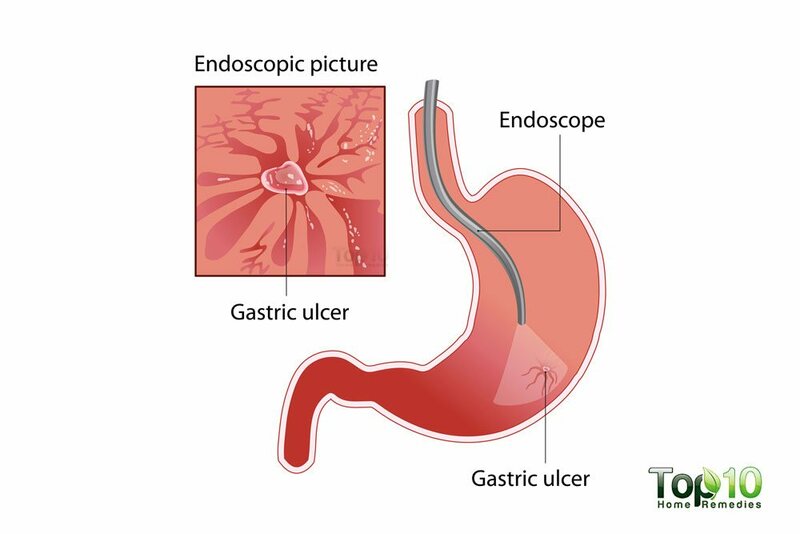 A stomach ulcer, also known as a peptic ulcer, occurs when open sores develop on the inner lining of the stomach or the upper portion of the small intestine. Peptic ulcers are of two types: gastric ulcers that are in the stomach and duodenal ulcers that are in the upper portion of the small intestine. The most common cause of peptic ulcers is an infection due to the bacterium Helicobacter pylori (H. pylori). Other causes include long-term use of aspirin and certain other painkillers, such as ibuprofen and naproxen sodium. People are at an increased risk of suffering from a stomach ulcer if they smoke a lot, drink alcohol in excess, lead a stressful life and eat spicy foods. It is important to consult your doctor if you think you have a stomach ulcer. Your doctor may prescribe an antibiotic to treat the bacterial infection and recommend antacids to reduce the acid in the digestive tract. At the same time, you need to watch what you eat. There is no specific diet prescription for a stomach ulcer, but you can keep symptom flare-ups to a minimum and promote faster recovery by limiting or avoiding certain foods. Here are some of the foods to avoid if you suffer from a stomach ulcer. While it is true that high alcohol intake is one of the risk factors of peptic ulcers, it is also a problematic beverage for anyone who already has an ulcer. It can increase the acidity level in the stomach and therefore aggravate symptoms of existing ulcers. A 2000 study published in the American Journal of Gastroenterology reports that fermented and non-distilled alcoholic beverages increase gastric levels and acid secretion. 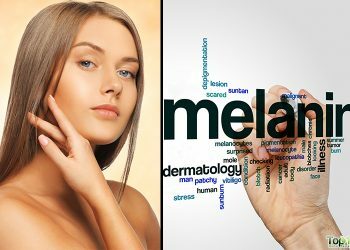 Succinic and maleic acid present in certain alcoholic drinks also stimulate acid secretion. Not only does alcohol increase the gastric acid in your system, but it can also leave you dehydrated. 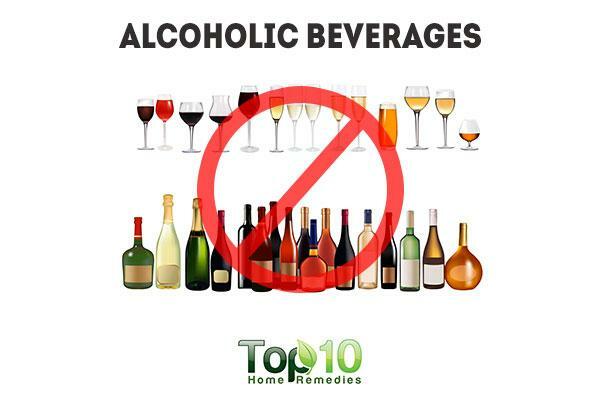 Hence, if suffering from an ulcer, it is best to avoid alcoholic beverages completely or consume them sparingly. If you are trying to heal a stomach ulcer, it’s time to cut down on your intake of coffee as well as other caffeinated products. While coffee does not cause stomach ulcers, it can potentially irritate an existing one. Coffee contains caffeine and other components that are known to increase the production of stomach acid. 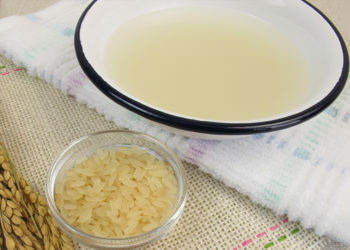 A 2010 study by the American Chemical Society identified two such substances – catechols and N-alkanoly-5-hydroxytryptamides that stimulate stomach acid secretion in human stomach cells. Also, coffee tends to speed up the process of gastric emptying, which may lead to highly acidic stomach contents passing into the small intestine more rapidly than normal. This may worsen your current symptoms. 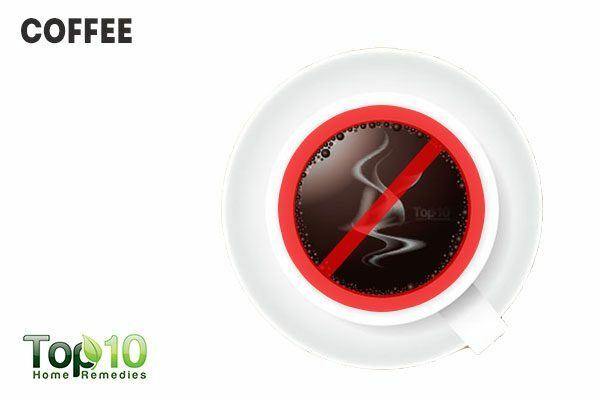 Along with regular coffee, you must also avoid decaffeinated coffee. It also increases acidity to a greater degree. 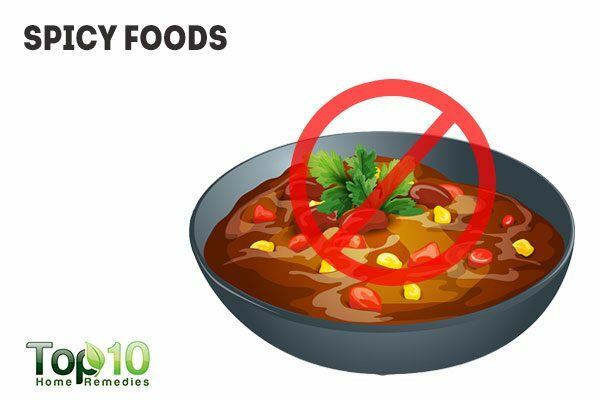 That spicy foods can cause stomach ulcers is a common misconception. However, spicy foods like hot peppers and seasonings can irritate the lining of the stomach, thus irritating existing stomach ulcers. So, spicy and acidic foods can worsen the symptoms of stomach ulcers in some people. However, not all varieties of chillies and peppers are bad for ulcers. Scientists believe that the active component capsaicin present in red peppers, such as cayenne pepper, may help inhibit acid secretion instead of stimulating it. Plus, it may help stimulate alkali, mucus secretions and gastric mucosal blood flow. Hot peppers, though, may not work for everyone. Also, steer clear of processed and deep fried foods as they require more stomach acid for digestion, thus worsening the symptoms. 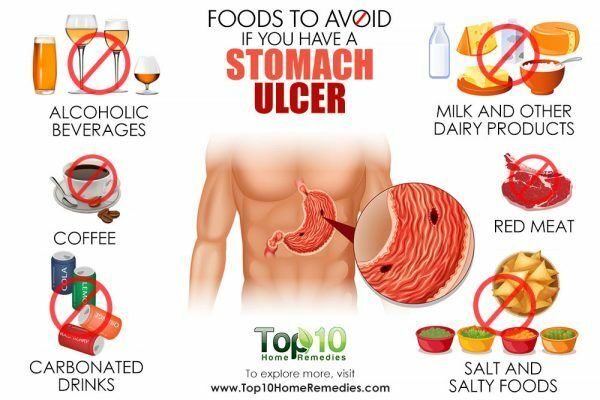 People suffering from a peptic ulcer should avoid red meat totally. Most red meat is high in fat and protein and takes a longer time to digest. As it stays in the stomach longer, more acid is released to digest it. More acid in the stomach can irritate the stomach lining and worsen the ulcer symptoms. Red meat can even weaken the bowel lining, which can affect the digestion process. 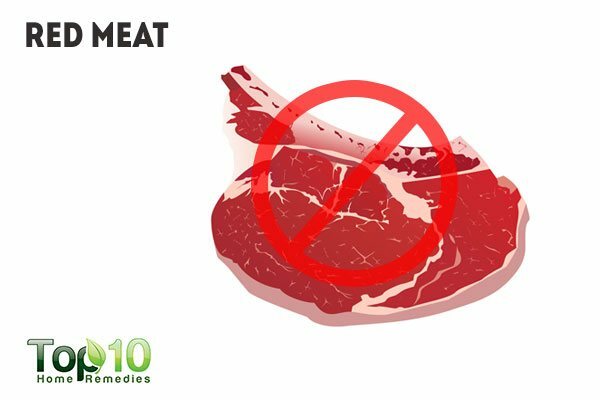 Avoid red meat completely until your ulcer has healed. Remember, red meat is not the only source of protein. 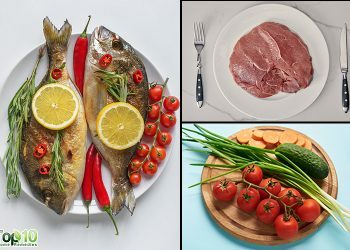 You can get protein from other sources, such as chicken, turkey and fish. However, always remember to remove the fatty skin from chicken before cooking it. Any kind of carbonated drink can irritate the lining of your stomach and small intestine, two common areas where ulcers develop. Most carbonated drinks contain citric acid as a preservative and flavor enhancer, which increases the beverage’s acidity. So, when you drink such beverages, the volume of stomach acid can rise much higher than what your stomach naturally needs for smooth functioning. This increase in stomach acid can irritate ulcers that already have developed in your digestive system, but will not cause more ulcers to form. 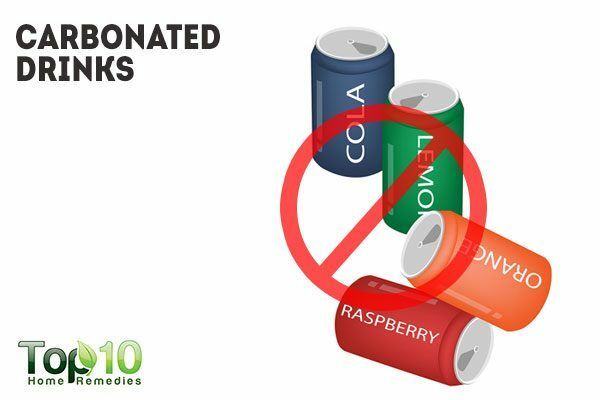 Hence, you should eliminate carbonated beverages to prevent worsening of your current symptoms. Some people may find that a cold, creamy cup of milk provides some temporary relief, but in reality it worsens the symptoms of a peptic ulcer. 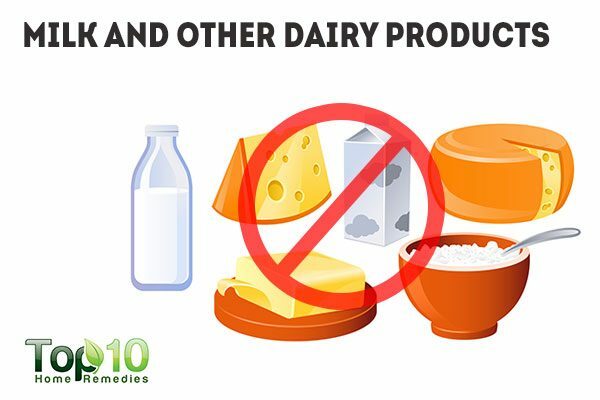 Whole milk as well as many dairy products are high in fat that can aggravate your current symptoms. Also, the protein in milk may encourage the production of excess stomach acid that can make an ulcer worse. Even drinking milk on a full stomach can make things worse. Along with whole milk, strong-flavored cheeses, cream and buttermilk should also be avoided. High intake of salt is linked to a higher risk of stomach ulcers. In fact, if you are already suffering from a stomach ulcer, you should avoid adding salt to the food on your plate and look at food labels so you can choose low-sodium options. More salt intake means aggravating the present symptoms. In fact, a high-salt diet may induce gene activity in H. pylori, making it more virulent and increasing the likelihood that you’ll suffer from severe symptoms. High sodium intake may also make the medications used for treating stomach ulcers less effective. 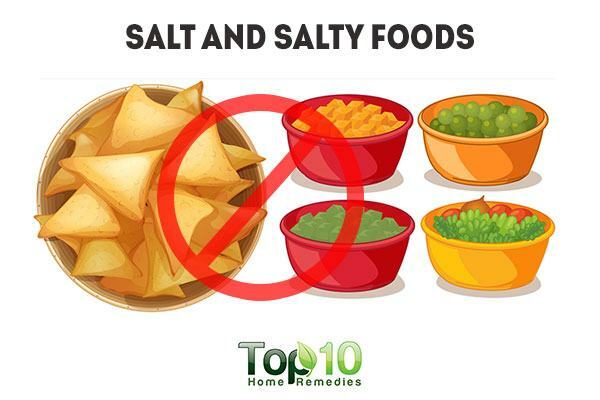 Try to avoid foods that are high in salt, such as cornflakes, blue cheese, bacon and other salted meats, salted nuts, corn and potato chips, tortilla chips, canned soup and others. Always read the labels and choose low-sodium varieties. Avoid eating just two large meals in a day. Instead, eat five or six smaller meals every few hours. Don’t go on an empty stomach for long periods of time. Avoid eating close to bedtime. Eat your dinner about three to four hours before going to sleep and take a walk for 30 minutes after having your dinner. Do not neglect the importance of water. Try drinking a full glass of water when symptoms arise and a glass with every meal. 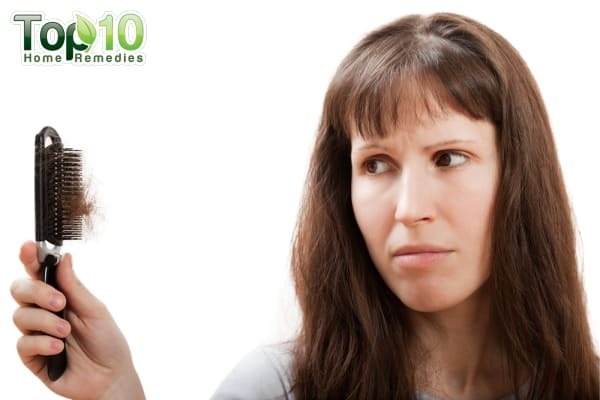 Reduce stress, as it can certainly worsen your symptoms. Stress can trigger an increased release of stomach acid and raise inflammation. Quit smoking, as it raises the recurrence rate of ulcers and also makes it more likely you’ll develop infections. U are too much,very useful information.thanks u so much. Thank u. So useful and educative. Stomach ulcers will restrict the food it is possible to take in and we have an answer for yourself. Very useful messages, GOD bless. Comment: thanks a lot av learned so much about how to handle this stomach ulcer really really appreciated…thank u!!! thank you so much for letting me know what to avoid. thanks, appreciated.. I will educate my son as soon as possible. thank you very much and very worthuful information, God bless you. Comment:Thank u so much for this useful information.This ulcer must go finally this time in Jesus name. Thanks very much for your worthful information, instantly, the ulcer has gone forever. Comment:thanks so much! I found your information so useful! 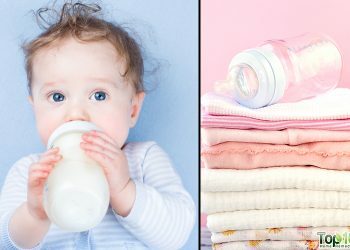 The only thing is that I feels relieved whenever I takes milk! Without me knowing that all it does is suspending my pains. Many thanks for the natural remedies and preventive measures for the turbulence sickness called ulcer. Sincerely the findings really help.